I wanted to wish you all a happy and safe Halloween this year! I hope your evening is fill with fun and yummy treats! If you are curious, I created the spider by punching out a 1″ circle in Basic Black and then used the Curly Label punch to punch out the legs (you just slide the edge of the paper just barely into the punch to create the thin legs). The mummy is just wrapping some ribbon around a Basic Black square and then adding white gel pen eyes. And the pumpkin is the 1″ circle punch again only I cut out 3 and layered them so that two overlapped and then the center pumpkin covered up the overlap. Add a bit of chocolate chip cardstock for a stem and you’re done! 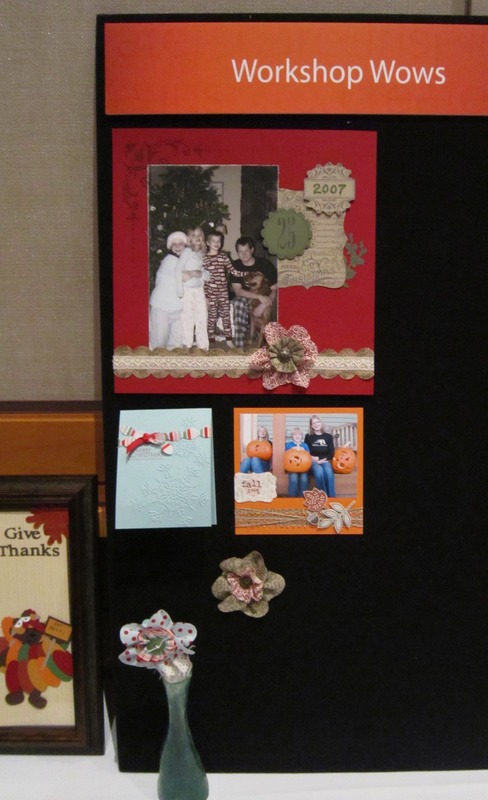 Well, the board is almost full and so that mean I will be drawing shortly for one lucky person to get a $50 Stampin’ Up! shopping spree! So, this is the last call for entries into the drawing. 1. For every increment of $25 you order (on a single order) you get a space on the board. 2. 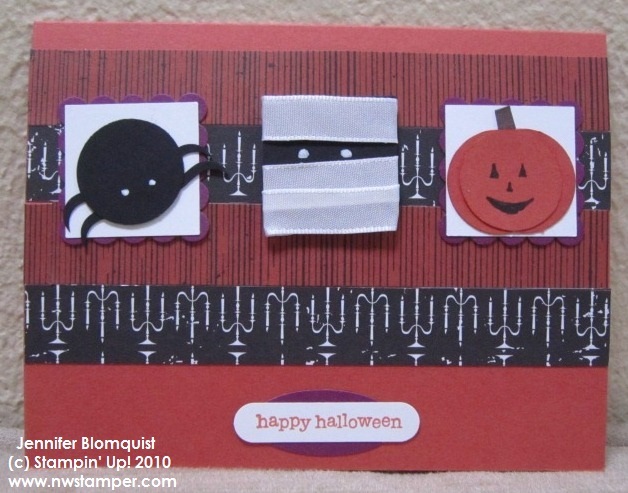 Join my Stampin’ Up! team and get three free spaces on the board. I expect these spots to fill up in the next day or two so let me know if you want to claim them as yours! Yesterday I shared a thank you card I made for a future hostess with some fun punching with the new Decorative Label punch. Well, today, I thought I would share another card along the same lines. Well, I was on a roll with the decorative label punch and so after playing a bit came up with this card for my friend to thank her for hosting a workshop with me. 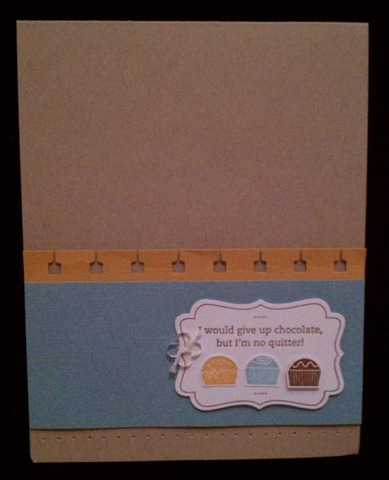 For this card, the Thank You sentiment is punched out using the Decorative Label punch. 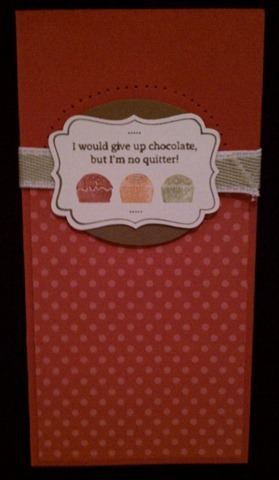 I turned the punch vertically (so it was tall and narrow) and punched out the Thank You at the top of the punchout shape. Then I pulled the end of the punchout (the part with the stamped image) through the middle of the back of the punch so that it wouldn’t get cut again, and slid it down so the Thank You sentiment was just above the bottom of the punch opening and cut it out. Again, I know that can be hard to visualize so I will try to get a photo explanation out soon. I also punched the corners of the card with the same Decorative label punch to get the curved and indented corners. Love it! 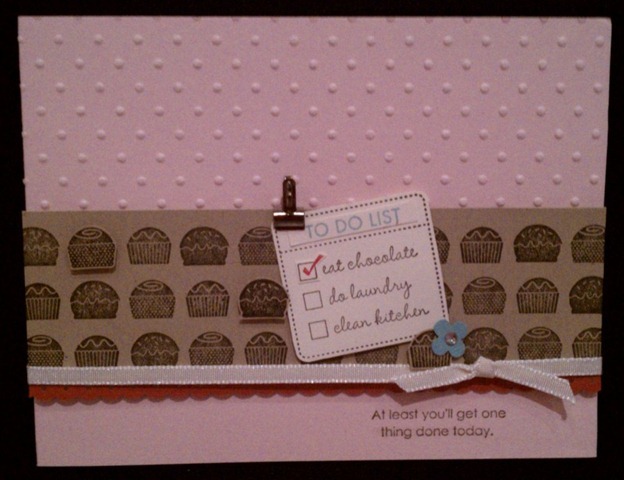 Did you know you can get this punch along with the matching Tags til Christmas stamp set as a bundle for 20% off? Check it out! Well, guess what? My camera battery died and I don’t have my charger with me. Sigh. Thankfully my cell phone takes decent pictures and so i was able to get a couple reasonable shots to last me until i can get my battery charged. I wanted to share this card with you because of the fun punchout I created. 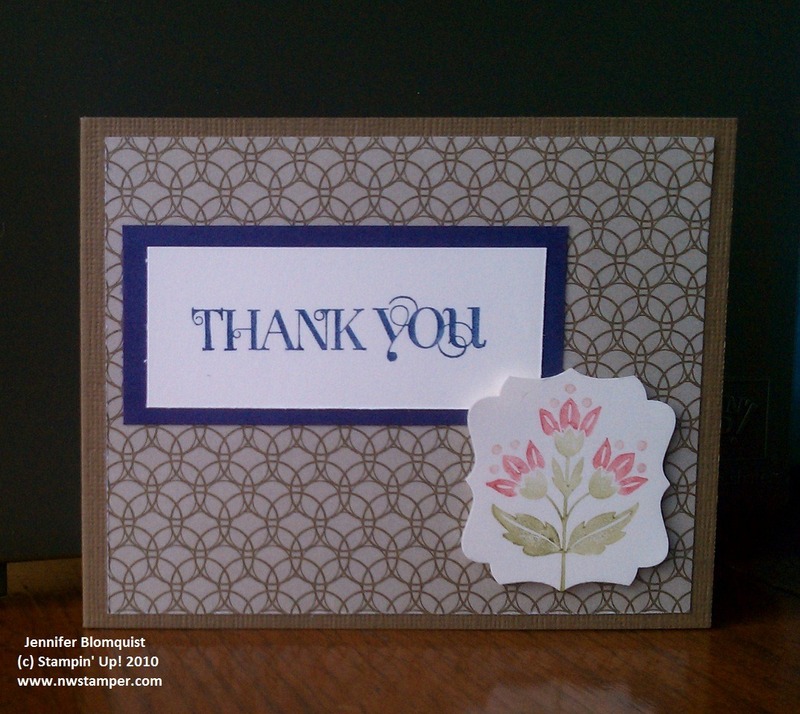 This is a thank you card for a friend who is going to be hosting a workshop with me in a couple weeks. 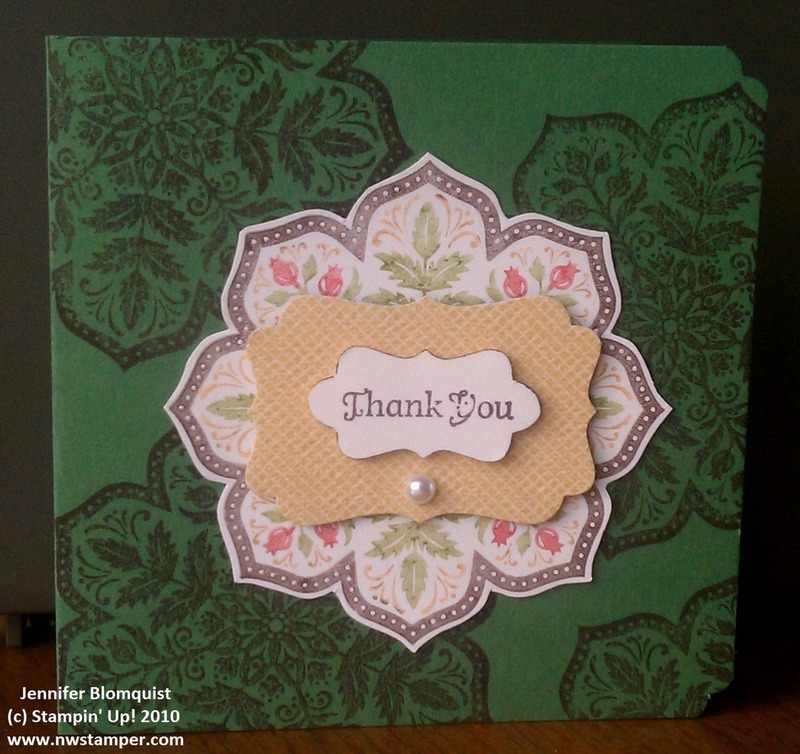 I had been playing around with my new Day of Gratitude stamp set from the regional and my Designer label punch and ended up with the punched flower below. I made the flower by punching out the flower with it in the center of the designer label punch. Then i took that punch out and slid it back into the punch so that one end of the punched out shape was in the punch and the other end was pulled up through the opening in the back so that when I squeezed the punch, only half of the paper would be cut. I then repeated that again on the other side. i know that is totally confusing 🙂 so, i’ll try to take some photos when my camera is working again to show you what I mean. But I have to say, this punch is awesome for playing around with different punch shapes. I got some photos taken but then got so busy finishing prepping for my friend Jenny’s workshop tomorrow that I didn’t get them edited in time to post today. 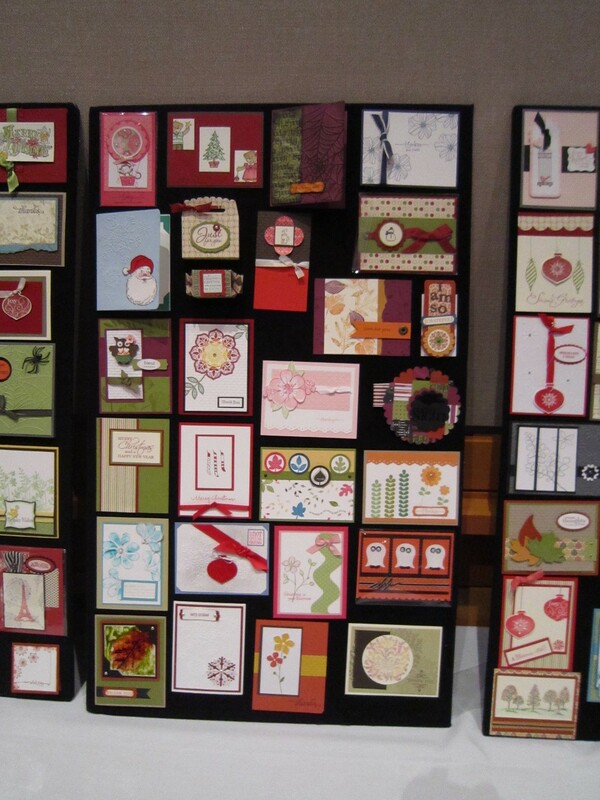 So, here are a couple more display boards to keep you inspired. 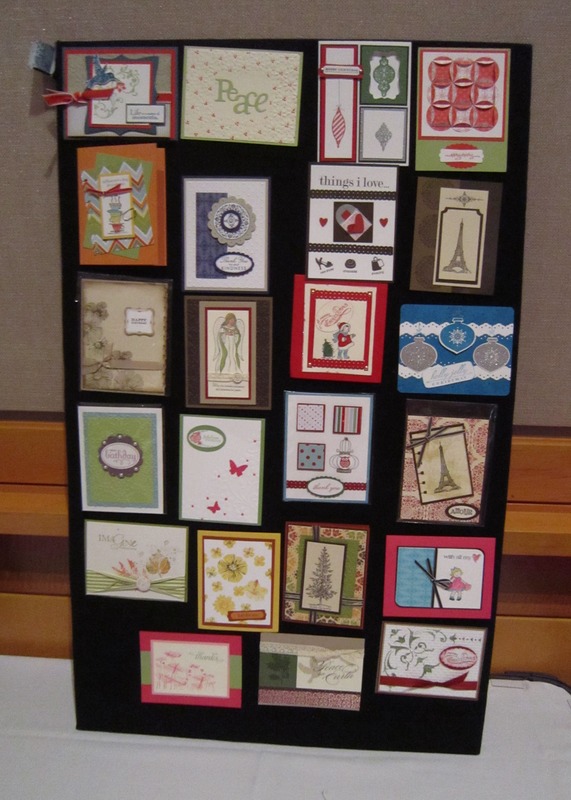 Since I’m still working on getting photos of some of the fabulous swaps I received at the regional on Friday, I thought I would share with you a couple of the display boards that I was able to photograph. Hopefully these photos are clear enough that when you click on them to enlarge you can see the detail on the cards. 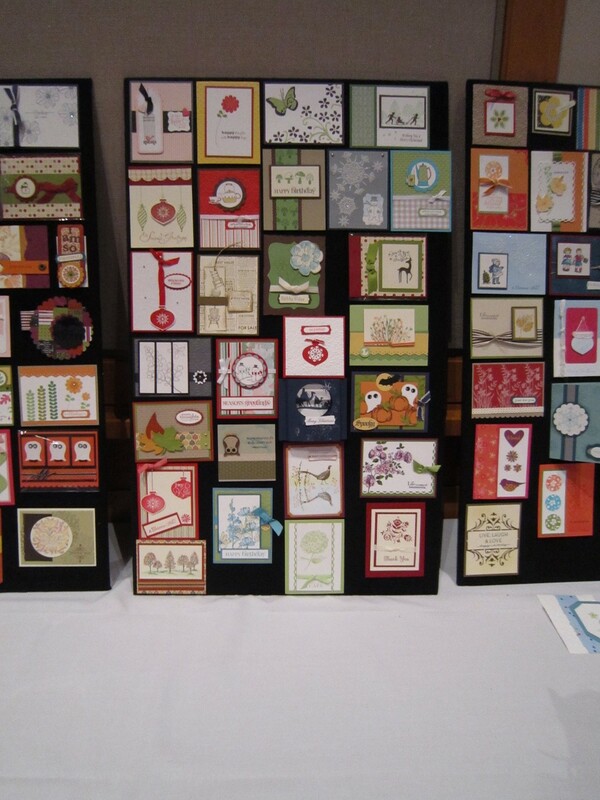 I’m always so impressed with the samples displayed at Stampin’ Up! events and then even more so when I realize that most of the cards and projects displayed are actually created by fellow demonstrators and not just the artists at SU headquarters! Man, yesterday was the Stampin’ Up! 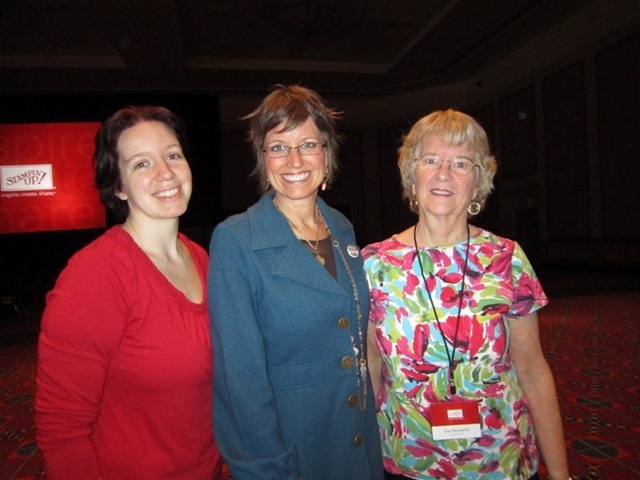 regional seminar in Portland, OR and I attended with my mom and my friend Sue. I flew into town late Thursday night with the hubby and Nicholas. I was very behind on getting ready and ended up not making swaps until 12:30am the morning of regionals. I ended up getting too tired and so I took my last few pieces and raced to finish my swaps before everything started. Imagine my surprise when I heard “is this the last minute finishing of swaps?” and I started to respond and looked up to see the speaker was none other than Shelli Gardner herself! So, of course I had to get a picture (and how does she always take a perfect picture and I always look just a little goofy?) Anyway, this is me, Shelli, and my friend Sue. That was super cool to chat with Shelli before things got started (we were actually on the path between the stage and the staff table so she stopped and chatted with us a couple times. She is a really cool lady). I have tons of cards and techniques to share with you over the next many blog posts but today I wanted to share with you the AWESOME recruit promotions that Stampin’ Up! is offering for anyone signing up to be a demonstrator in the next two weeks. 20%+ discount on all your stamping supplies, now is the perfect time to join. 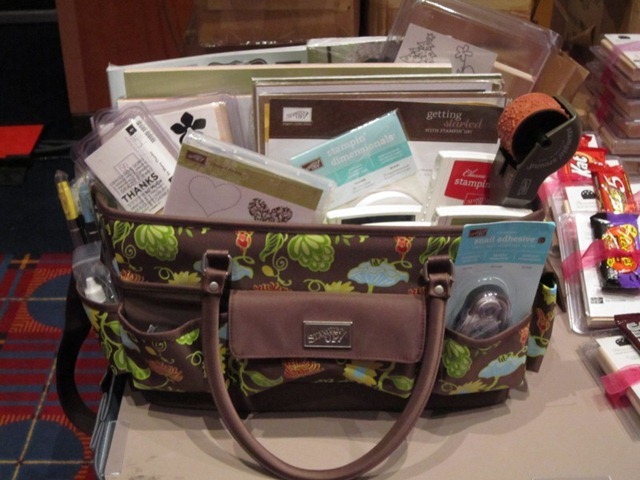 As if the amazing deal that the starter kit is wasn’t enough, Stampin’ Up! has provided some extra bonuses for anyone who joins the team of a demo who attended a regional event. Interested in learning more about this opportunity? Email me at jennifer@nwstamper.com and I’d be happy to send you more information.